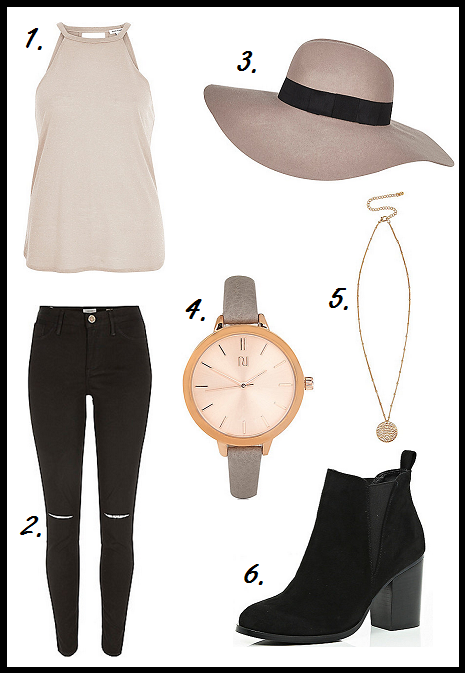 Hey guys, today I put together this casual look with some pieces from from River Island. I really like it and the idea of wearing a fedora, although I’ve never worn one before. Also, I’m starting to realise that I have a very big obsession with boots and want almost every pair I see so I had to put some in the look. Below are the links to the each individual item and the reasons why I chose them. This is a nice, simple top that would go with almost anything. I love the colour and the style; a perfect staple for any wardrobe. I love ripped black jeans and jegging and already have a pair that I got from Penneys for only €8 that I wear all the time. These River Island ones are gorgeous but a bit overpriced so I’d recommend getting the Penneys ones unless you want a pair that is a bit more high quality. I love the mink colour of this hat, it’s so pretty! Don’t worry- it’s not made of mink which is what I thought when I first read the name. If I was going to get a fedora I would love to get one like this but I don’t know if I could spend so much on something that I don’t know if I would be able to pull off. I think I’ll have to find one that is cheaper to buy and see how much I wear it before I get one for almost €40. This watch is gorgeous. I love rose gold jewelry and the style of this watch is so pretty! It also came in pink which was equally as nice but I think it’s out of stock now. The neutrality of this watch means that you could wear it with so many different outfits and get a lot of wear out of it. This is a gorgeous, simple pendant necklace. I’m not a big fan of jewelry, especially necklaces but this is the kind of that I like, really casual and relaxed. As I’ve already said, I love boots so much, especially ankle boots. I saw a couple of other pairs on the River Island website that I really want but I always have to try to resist from buying boots because I have quite a few pairs already. These ones are really great and they also come in brown which I want as well haha. In an ideal world I would be able to buy as many pairs of boots in every colour possible but in reality, spending €100 on boots that I don’t need is not such a great idea. Oh well, a girl can dream.. This was NOT a sponsored post although all the items were from River Island, I just really like their clothes! I hope you enjoyed this post and liked the look. Make sure to save it on Bloglovin or give it a +1 on Google Plus if you did. Also, please leave a comment below letting me know which item was your favourite from the look. I’ll talk to you soon.